At the same time, CTV News in Canada has obtained a draft copy of a declaration between the U.S. and Canada entitled "Beyond the Border: A Shared Vision for Perimeter Security and Competitiveness," to be implemented by a newly created Canadian-U.S. "Beyond the Border Working Group." The two documents strongly suggest the Obama administration is pursuing a stealth bureaucratic methodology to establish a common North American border around the continent, encompassing the U.S., Canada and Mexico, while simultaneously moving to erase the borders between the U.S. and Mexico as well as between the U.S. and Canada. Under the Bush administration's SPP, the U.S., Mexico and Canada organized some 20 different "shadow government" bureaucratic working groups composed of agency heads and undersecretaries in the three nations. The groups span a wide range of policy areas, from e-commerce, to aviation policy, to borders and immigration, trilateral travel, transportation, energy, environment, food and agriculture, health and financial services. WND has reported since 2006 that a blueprint published in 2005 by the Council on Foreign Relations entitled "Building a North America Community" called for the establishment of a common security perimeter around North America by 2010 to facilitate the free movement of people, trade and capital between the three nations of North America. In his 2001 book, "Toward a North American Community," American University professor Robert Pastor, a co-chair of the CFR blue ribbon committee that authored "Building a North American Community," called for the creation of a North American Commission, a North American Parliament, and a North American Court on Trade and Investment. The language of the documents declaring "A New Border Vision" with Mexico and Canada could easily have been lifted directly from the CFR report or Pastor's book. The 2005 CFR report "Building a North American Community" called on page xvii of the Foreword for the "establishment by 2010 of a North American economic and security perimeter, the boundaries of which would be defined by a common external tariff and an outer security perimeter." CTV News reported that the language of the draft agreement specified that "A New Border Vision" for the U.S. and Canada would involve "a perimeter approach to security, working together within, at, and away from the borders of our two countries in a way that supports economic competitiveness, job creation and prosperity, and in a partnership to enhance our security and accelerate the legitimate flow of people and goods between our two countries." Similarly, the U.S. State Department fact sheet calling for "A New Border Vision" with Mexico specified five areas of "joint border management, co-responsibility for cross-border crime, and shared commitment to the efficient flow of legal commerce and travel," namely: enhancing public safety, securing flows of people and goods, expediting legitimate commerce and travel, engaging border communities, and setting policy. Under "setting policy," the State Department fact sheet with Mexico called for achieving rapid policy change through "an agile inter-agency process within each country as well as a means by which both governments can easily coordinate at a bi-national level." This provides additional support for the conclusion that the bureaucratic "working groups" established under SPP in the Bush administration will continue to operate under the Obama administration. A new level of collaboration on preventing and recovering from counter attacks. Affirming the continuance of the working group process, the draft declaration with Canada specifies the U.S. and Canada "intend to address threats at the earliest point possible, including outside the perimeter of our two countries." The origin of the SPP can be traced to a trilateral summit meeting in Waco, Texas, March 23, 2005, between President George W. Bush, then-Mexican President Vicente Fox and then-Canadian Prime Minister Paul Martin. At the end of the Waco summit, the three leaders simply declared that the U.S., Mexico and Canada were now in the Security and Prosperity Partnership, without the signing of any international agreement between the three countries or the ratifying of any trilateral treaty by the U.S. Senate. The SPP in the administration of President Bush appeared designed to replicate the steps taken in Europe over a 50-year period following the end of World War II to transform an economic agreement under the European Common Market into a full-fledged regional government, operating as the European Union, with its own currency, the euro, functioning as the sole legitimate currency in what has become known as "the eurozone." 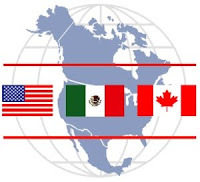 The concern was that under the SPP, the North American Free Trade Agreement, or NAFTA, could evolve into a regional government, the North American Union, with a regional currency, the Amero, designed to replace the U.S. dollar, the Mexican peso and the Canadian dollar. WND has reported analysts have believed the North American integration plan will proceed incrementally, largely below the radar, since the SPP was declared "dead" by one of its chief architects, American University Professor Robert A. Pastor, who for nearly 15 years has been a major proponent of building a "North American Community."